This installation is part of an ongoing project by Xenobia Bailey called Paradise Under Reconstruction in the Aesthetic of Funk. On view is the section, Mothership 1: Sistah Paradise’s Great Walls of Fire Revival Tent, which is inspired by the lack of historical documentation on the enslavement of Africans in America. Bailey creates a tactile representation of a mythology designed to explain the presence of Africans in America. She relates the history of colonization to contemporary struggles for justice and equality for African Americans. 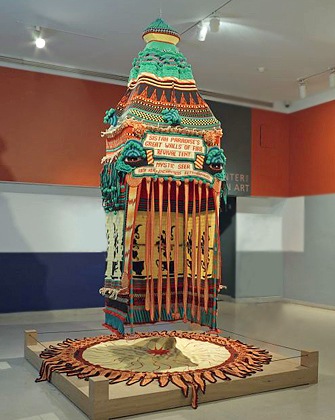 Working primarily in crochet, Bailey employs African craft traditions to connect African American heritage and African culture.